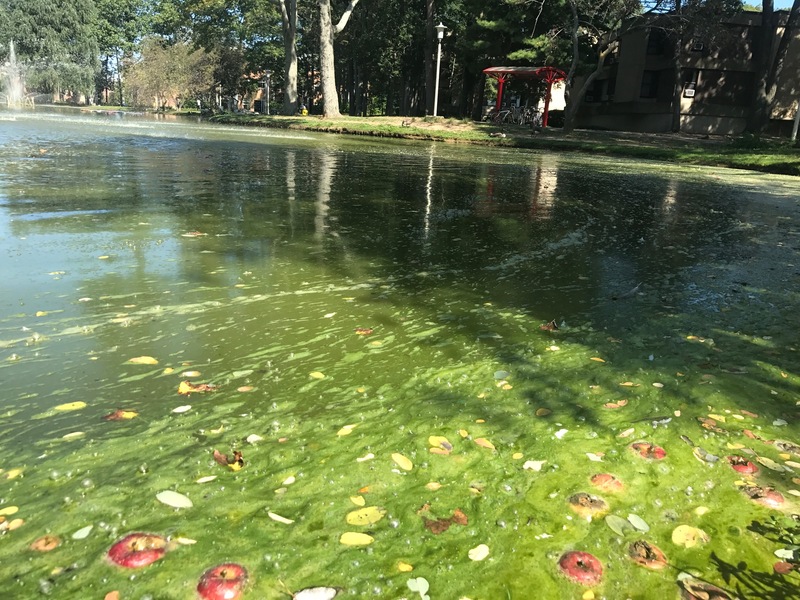 As the weather starts to heat up, Long Islanders headed to local beaches may have to share the water with an unwanted visitor: toxic algae. Last year, toxic algae was found in nearly every major bay and estuary across Long Island, according to data compiled by the Nature Conservancy, a national environmental organization. President of Friends of Bellport Bay, Thomas Schultz, explained that the excess algae blocks sunlight from penetrating the water column, thereby inhibiting photosynthesis. “We do have some bodies of water like that where there’s hardly any life at all because there’s no oxygen, there’s no photosynthesis,” he said. This problem is due in great part, to an excessive amount of nitrogen-heavy sewage seeping into local waterways. A 2011 study published in the Journal of Coastal Research found that outdated septic and cesspool systems accounted for 69 percent of nitrogen in the Great South Bay. In an attempt to lessen the problem, the Suffolk County Legislature placed a full ban on new cesspools last December. Similar legislation was passed in 1973, but a loophole in the old law made it so that homeowners with existing cesspools didn’t have to add in septic tanks. While septic tanks help to filter and drain raw sewage, cesspools alone simply store the waste until it can be pumped out. “I would like to say that we, as a county, have adopted the policies necessary to adequately address our region’s nitrogen pollution epidemic, but in reality this gets us closer to where we should have been in the decades following 1973,” Legislator Kara Hahn stated in a press release after the law was passed. Starting this July, professionals in the wastewater industry must report septic and cesspool failures to the county. By July of 2019, the county will require residents to obtain a permit when installing new septic systems. President of Certified Cesspool and Drain Inc., Salvatore Motta, said the law initially caused alarm among wastewater professionals, but the county has since been doing its best to accommodate their needs. On the other hand, Legislator Robert Trotta contends that the law is largely inconsequential and that the real purpose is to raise revenue through permit fees. “It’s a total fraud. Adding a septic tank does nothing. It doesn’t treat the nitrogen in the water at all,” Trotta said. Trotta suggested that the only way to cut down on nitrogen pollution is to install specially designed wastewater systems called nitrogen reducing bio-filters. Suffolk County currently offers $10,000 grants for homeowners who install these bio-filters, but Motta said this is not enough incentive for many Long Islanders. Despite this hefty initial investment, postdoctoral scholar at Stony Brook University’s Center for Clean Water Technology, Stuart Waugh, suggested that purchasing a bio-filter may actually be more cost-effective in the long run. Scientists at the Center for Clean Water Technology are currently designing new bio-filters that they hope will be more accessible to the general public. “Our goals are to have a system that reduces nitrogen to under 10 mg per meter that costs under $10,000 and that will last for at least 30 years,” Waugh said. Until that happens, environmental activists like Schultz continue to push for temporary solutions that could lessen the detrimental effects of nitrogen pollution. “One of our initiatives is to plant shellfish in Bellport Bay,” Schultz said, adding that shellfish consume algae which helps to remove nitrogen from the water column and restore healthy oxygen levels. Friends of Bellport Bay is also spreading awareness about the harmful effects of traditional fertilizer, which has a dangerously high nitrogen content. Earlier this year they bought 400 pounds of special eco-friendly fertilizer from a nursery in the east end and set up a central pick-up location where community members could easily purchase the low-nitrogen alternative.